The Norwegian's predecessor Jose Mourinho spent £360m on new players, recouping just £75m. 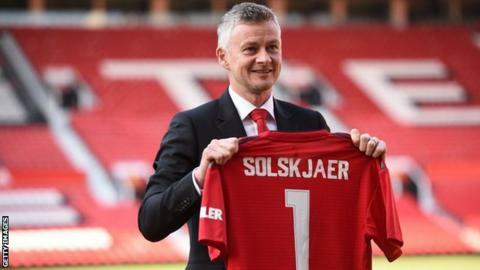 But Solksjaer said he would not be too hasty in the transfer market: "We will not spend money just to spend money." "United is a club that has money but people who know me, know I will use that in a good way," he added to Norwegian TV. Of Mourinho's big-money purchases, only Paul Pogba and Romelu Lukaku have made a significant impact, with some - Alexis Sanchez being a prime example - barely making a positive contribution at all. They have already been heavily linked with a number of potential targets - including England youngsters Jadon Sancho and Callum Hudson-Odoi. United are hopeful both will eventually agree new terms and are viewed as significant members of Solskjaer's squad. Both could leave for nothing in the summer and there have been rumours Herrera has already agreed to join Paris St-Germain, although they have been played down by sources close to the 29-year-old former Athletic Bilbao midfielder. "Let's hope club and player find an agreement," he said. "Ander has been very good since I came in. We will have a strong squad next season and we want the best players."